I love this sewing machine so much — it works perfectly, and it’s very quiet. I wish I could find out more of its history, but vintage Brother sewing machines are very difficult to trace. The Brother company doesn’t have an extensive database of serial numbers online like the Singer company, but if you write to them and send a photo of your machine, they are very helpful and will send you whatever information they have. I discovered that Brother started making sewing machines about 1951. I found some dated photos of earlier and later models on the Internet, so I am estimating that this model is from about 1955. If anyone else has this particular model, I would love to hear from you. 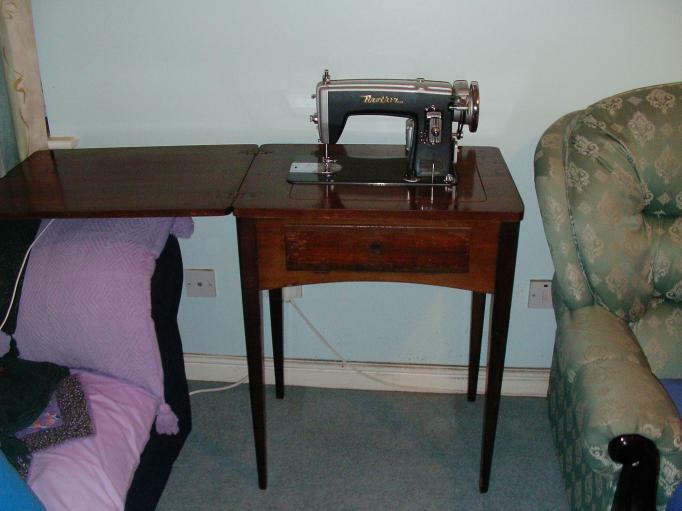 I bought a nice little sewing machine table for one of my old Singers, but the machine wouldn’t fit into it. Happily the table was a perfect fit for George. I am very jealous! 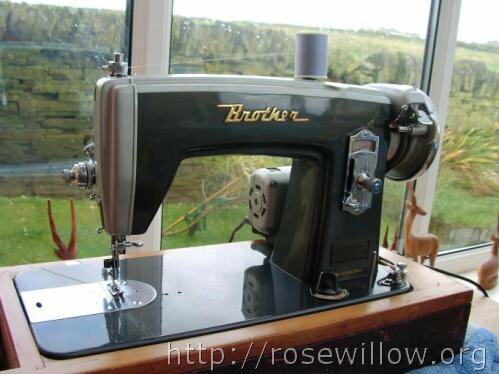 I love Brother sewing machines – I have two modern versions but would dearly LOVE to find one like yours!! 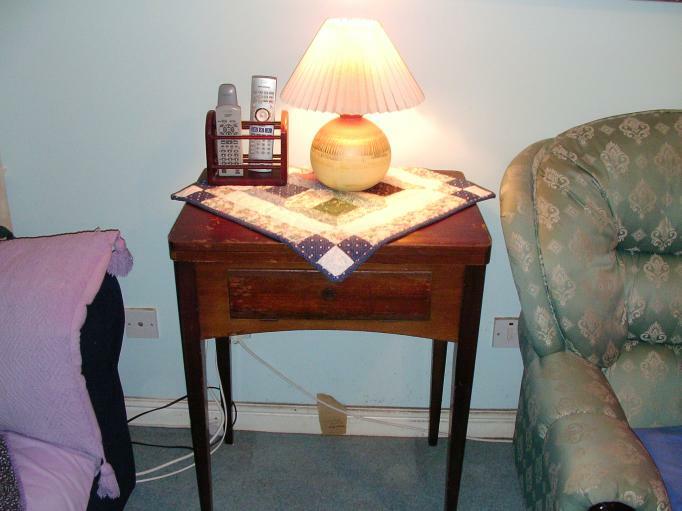 The sewing cabinet is just perfect – what a lovely piece of furniture! I have a Brother WindowMatic, Serial #LG 49818, complete with manual, accessory case and sewing cabinet and original purchase reciept from 1955. Would love to find a good home for it – anyone interested or can point me in the right direction? Thank you for your comment, and thank you for verifying that this model is actually from 1955 because I had to guess at the date. Are you in the UK? I think a collector would definitely be interested in your machine, especially since you have the manual and accessories. The original receipt is like a page from history. Dianne, your Brother is great but I just can’t get over the wonderful view out of your window, can we see more? Hi Helen and Stephanie, thank you for your nice comments! Stephanie, I’m glad you like the view! I’ll try to get you a better long-range photo next time. I like to take photos in that room because the light is so good in there. I name my machines too. Right now it’s “Chuckee”. Becka and LouAnn are ready and waiting. After your post, I realized I only have ONE machine with a male name. JEALOUS! Very cute sewing machine. I used to love to sew on Grandmother Francis’ machine, they just don’t make them as sturdy as they used to! I always get so jealous when I see everyone’s older machines…esp those in cabinets. One of these days I hope to have some extra room for one and will start a hunt to find one for me.